Devoted dog-owner Virginia Dowe Edwards creates charming dog sculptures from clay. Using roughly textured clay and smoke firing techniques, she creates dogs that are expressive and filled with movement and alive with detail – down to the floppy ears and paws complete with doggy toe-nails. They are not portraits or intended to be accurate likenesses of pets she has known but pets that we all recognise whether from childhood or in a current canine companion. The dogs Virginia makes are never static, she cleverly incorporates all sorts of doggy traits and mannerisms into her sculpting, such ear scratching, playful bowing, or a head cocked on one side, or paws folded over one another, things that we see our own pets doing. Virginia begins by making up the shape of the dog using hollow tubes of clay, which she cuts and forms leaving cut and torn edges of clay visible adding to their characterful appearance. 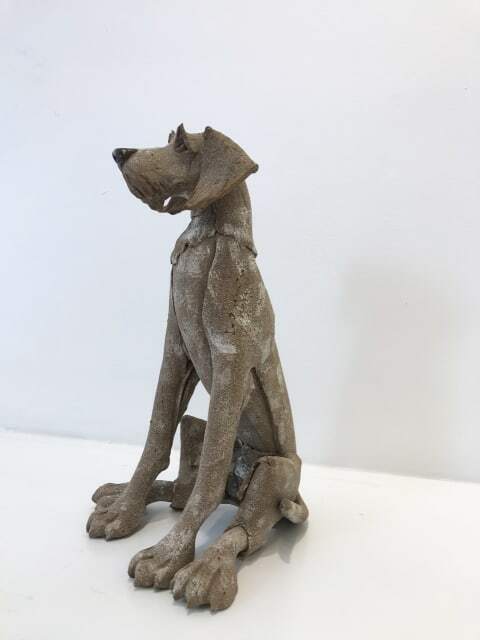 Once she’s finished building the dog into a shape and pose she likes, they are twice fired – once in the electric kiln and then again in the Raku kiln; a small, lidded brick pit which is packed with combustibles such as straw or newspaper and left to burn down overnight. The smoke gives the dogs their typical patchy look. Virginia Dowe Edwards studied ceramics at Wolverhampton University before becoming an artist in residence at Edgbaston School in Birmingham. Whilst she was there she began exhibiting her work at various galleries, before setting up her full time practice in 1999. Since then, she has exhibited all over the UK, working from home in a converted stable.